Well... strictly speaking the 'Inca Avalanche' is the mountain bike race that takes place once a year and starts at the very top of the mountain, near the pass ‘Abra’ Malaga. 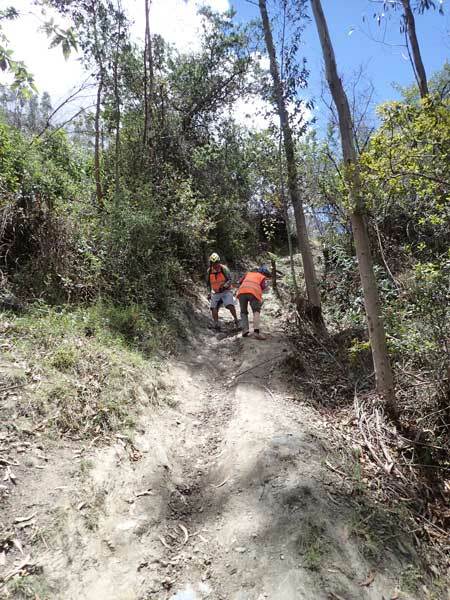 Three hundred competitors racing to be the fastest down 24km of descent, mostly on single track. It's carnage! It's worth watching some of the video on youtube.com. The Mountain Biking companies out here offer the Abra Malaga. 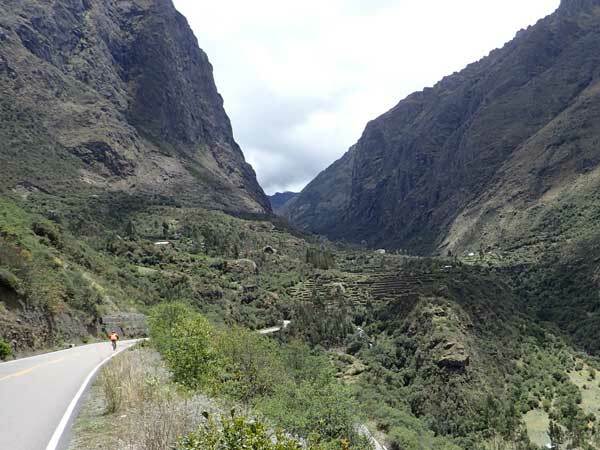 With most of them that means that you actually descend the tarmac road from Abra Malaga Pass at 4,350m to near the town of Ollyantaytambo at 2,635m metres. 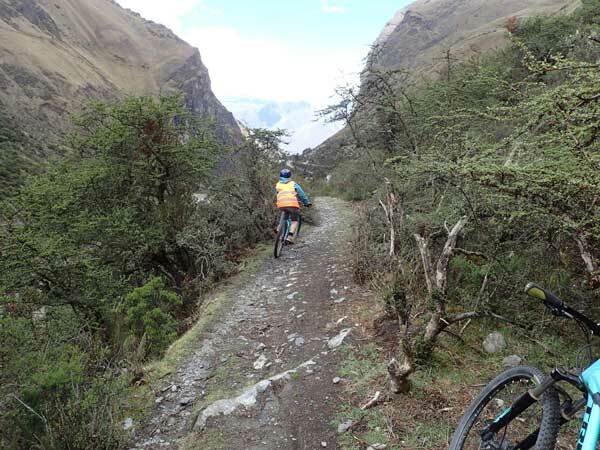 Because of all the loops in the road that means a descent of 44km and a vertical drop of 1,715m! 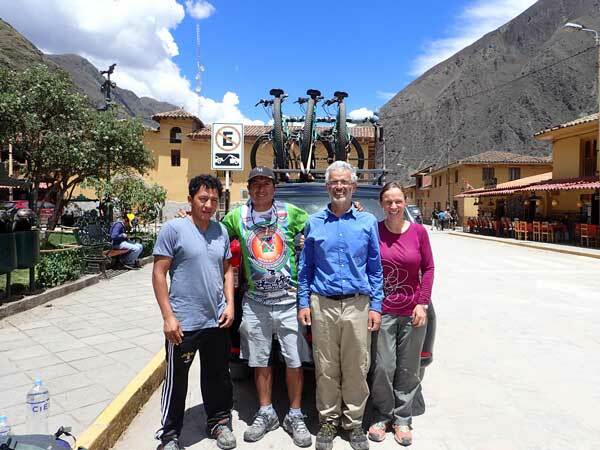 The company we chose, KB Tours, based in the main square in Ollyantaytambo, let you do as much of the single track as they think you can cope with. The difference of course is that we weren't racing and were planning to descend more or less in control. To give you some idea, the race was won in a time of 21 minutes and we took about two hours. 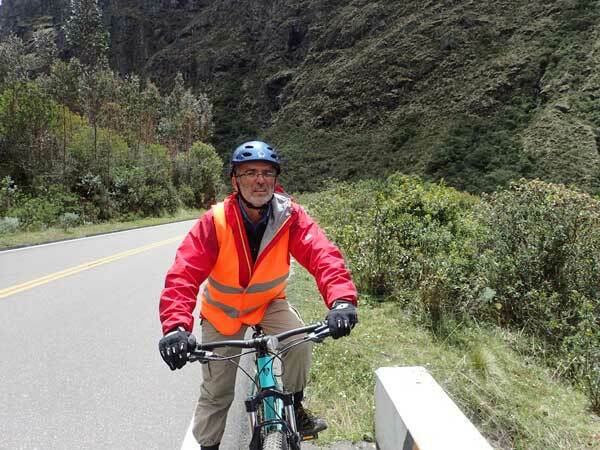 At 0900 we met our guide Abel and our driver, and settled down for the hour or so drive to the top of the pass. 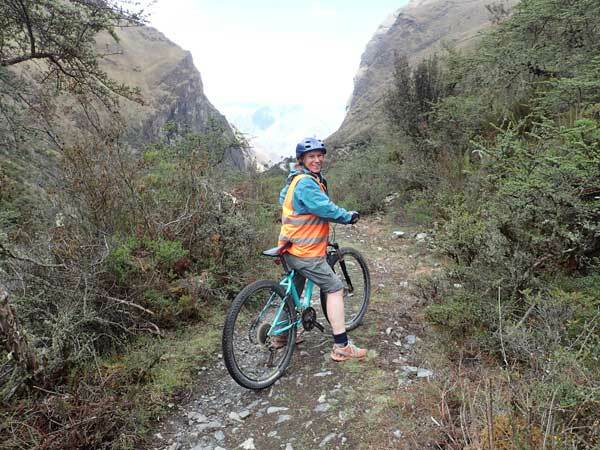 Once there we kitted out with helmets, gloves and fairly standard mountain bikes, front and rear hydraullic disc brakes but only front suspension. The tyres were ‘über' fat and this definitely helped absorb a lot of the bumps. Although we did a lot in Wales we had only mountain biked once since we started our voyage, and I went over the handlebars on that occasion. So, Mister control freak here was determined to warm up gently and get back into the swing of it before taking on anything too radical. 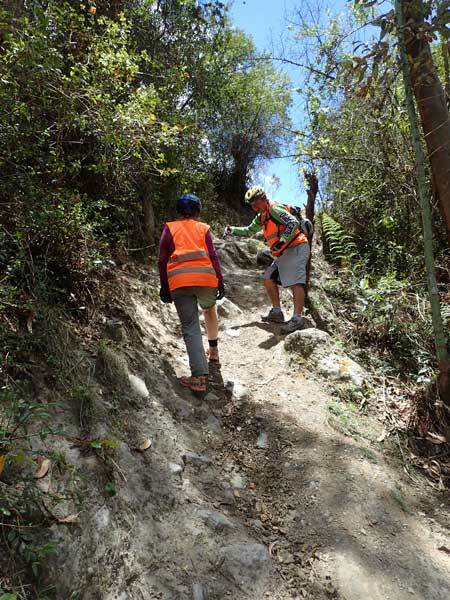 I therefore walked a couple of the steeper sections of single track that we initially encountered. Kath of course was as gung-ho as ever and hurtled down these fast enough to make our guide squeak! I soon got back into my stride and we were both 'hooning' down the seemingly endless miles of single track, interspersed with the odd bit of tarmac to link things up. 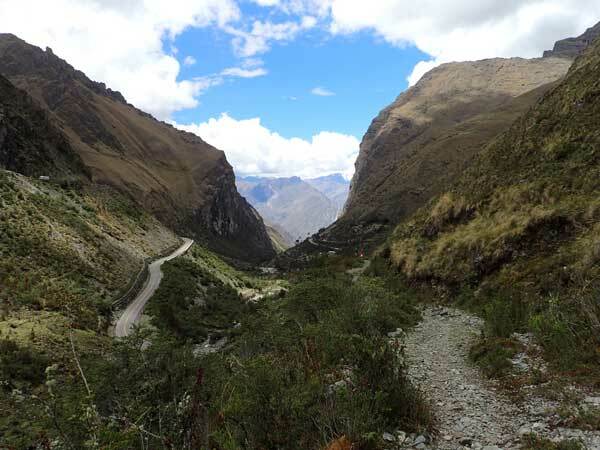 These sections were far more dangerous, as the average Peruvian driver is quite frankly nuts. They think that overtaking on blind bends is de-rigueur and that if you hoot your horn the oncoming vehicle will disappear into thin air. Our driver, who was following us down, would position the vehicle so as to protect us at the crossing points! Franco on the most dangerous bit! 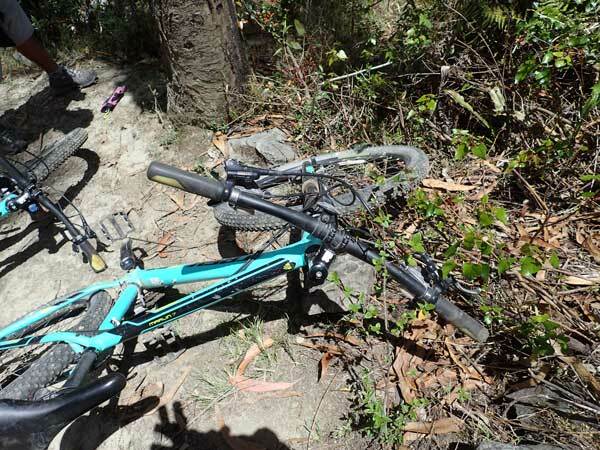 I then realised it was worse than that, in that the bike was going over the handlebars with her! By the time the dust settled I was down with Kath. Cunningly, I had taken my bike with me so there was no question of me riding down! Kath assured me she was all right but could I help her find the brake handle which had come off and maybe straighten the handlebars. We eventually found the bits, although some of them were broken beyond repair. At this point I noticed that Kath had a nasty looking cut between the bridge of her nose and her eye that appeared to be full of dust. Abel makes a temporary repair – he’d make a good yachtsman! 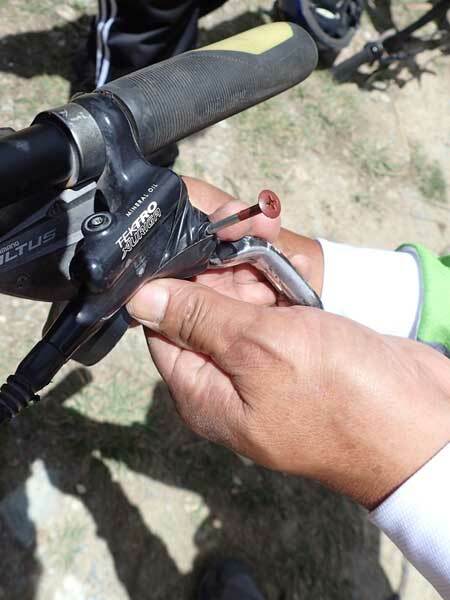 We made our way down to where the vehicle was waiting and while I cleaned out Kath's wound, Abel managed a wonderfully bodged repair to the brake handle, using a screw and some electrical tape. With bike and Kath suitably patched up we set off for the final 15 minutes of insane fun, swooping down to the valley bottom. What a great morning!